Dark Nights: Metal is the new comic book event miniseries from DC Comics. The series will run for six issues, and will include at least 19 individual tie-in issues. Some tie-ins will be original one-shots and others will be issues of currently ongoing comic book series (such as Teen Titans and Suicide Squad, to name two). Two of the tie-ins have already been published, Dark Days: The Forge and Dark Days: The Casting. The first “Metal” title was published on June 14, 2017 (The Forge) and the final comic book (Dark Nights: Metal #6) is scheduled to be published February 14, 2017. Dark Nights: Metal introduces the “Dark Multiverse,” and this miniseries is written by Scott Snyder and drawn (pencil art) by Greg Capullo, the creative team behind The New 52 relaunch of the Batman ongoing title. The rest of the creative team includes inker Jonathan Glapion; colorist FCO Plascencia; and letterer Steve Wands. Dark Nights: Metal #1 finds the Justice League – Superman, Wonder Woman, Batman, Aquaman, Green Lantern (Hal Jordan), Flash, and Cyborg – prisoners of Mongul. He controls the superheroes via special armor and forces the Justice League to entertain him and a stadium full of Braalians by fighting as gladiators. Thus far, the League has defeated its opponents, but Mongul is about to introduce newer and more powerful creatures. The team needs to escape because there is trouble on Earth: an attack on Gotham City and an ages-old secret on Blackhawk Island – a secret that will shake the foundations of the Multiverse now and forever. THE LOWDOWN: Of course, dear readers, you remember the 2012 film, The Dark Knight Rises, the third film in Christopher Nolan's THE DARK KNIGHT TRILOGY. [I think Warner Bros. requires that it be written all in caps.] Every scene and sequence in that film seemed to build to some crescendo – a crescendo that never happened. Hans Zimmer's score kept pounding and director Chris Nolan kept building his self-important cinematic “masterpiece” until its contrived ending arrives without ever delivering that crescendo. That movie was like one long, massive, elaborate chicken-choking session without the explosive payoff. Luckily, Scott Snyder knows how to build his Bat-crescendo, but he does not build towards one big climax. Dark Nights: Metal is a mystery, thriller, and horror story that uses scenes and sequences to create anticipation – some are loud and big and others are simply tense. Snyder offers clues and secrets; and the prize is not necessarily a crescendo. Maybe, Metal finishes with a series of big reveals, and/or maybe, in the end, it adds something new to the DC Comics Universe. So let's say that Dark Nights: Metal #1 gets it right by creating anticipation rather than exploding in our hands after only three strokes... I mean, three pages. 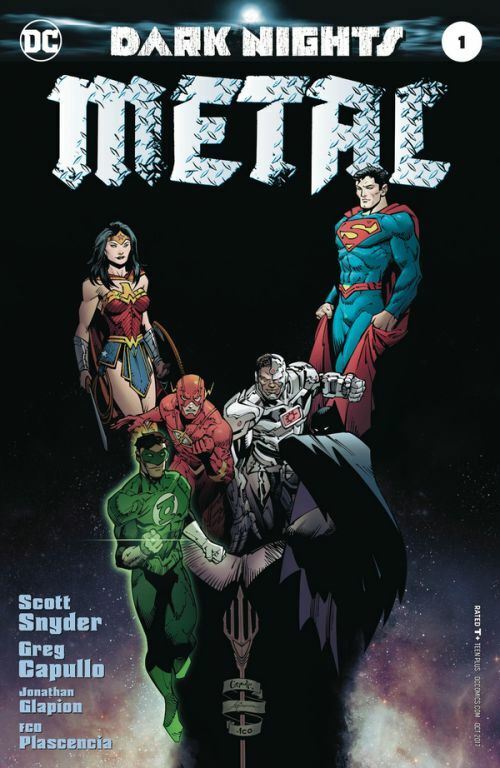 I READS YOU RECOMMENDS: Fans of the Scott Snyder-Greg Capullo team will want Dark Nights: Metal.